I spent a little while in Barcelona recently and was fortunate enough to visit UPF to look at some of the new technologies that they were working with. I know its a tough job, but i rose to the occasion as ever. 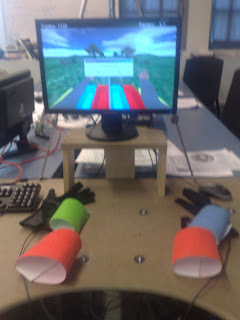 One technology I managed to get my hands on (or in) was a set of Glove controllers. 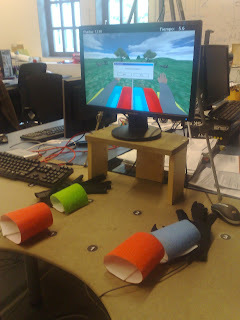 Whilst they took a bit of getting used to, especially with my big hands, the technology was very easy to use and certainly encouraged co-ordination and movement. The question that sprang to mind as I used the technologies was how was the specialist technology different from many of the things that I could do on a Nintendo Wii or more recently things that we see developing on the Microsoft Natal platform. The real difference that the system offered lay in the software, which leads us to the potential of such virtual worlds being made commercially for mainstream platforms or dare we suggest as open source or creative commons options. Those could then be made available via the online delivery of software that is available via wii points or Xbox live. But the really important thing is that after practice I became really good at hitting the ball back and Im happy to take on all comers !